OMA invites you to John Day, Oregon to explore this year’s conference theme, Finding Common Ground. As museum professionals, we can inspire community collaboration and serve as sites for social dialogue on challenging topics and current events. We are asking participants to share stories and strategies for how we can strengthen our museums through cultural inclusion and community engagement. The road trip to John Day is one of the best Oregon has to offer. “Where the high desert meets the mountains.” September is one of the most beautiful months for scenery with the fall foliage in full bloom. Grant County features pine forests, mountains, lush range lands and sweeping river valleys. You will have opportunities to visit the Kam Wah Chung State Heritage Site; the John Day Fossil Beds and Thomas Condon Paleontology Center, and Cant Ranch; DeWitt Museum at Depot Park; and the Grant County Historical Museum. The conference will be held high above the city at the Grant County Regional Airport. 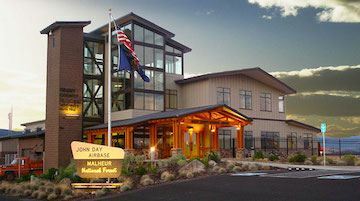 The John Day/Grant County Regional Airport is one of the newest, most energy efficient, environmentally friendly structures of its kind anywhere in the Pacific Northwest. It was designed as a multi-use facility and has completely outfitted conference and training rooms. The passion, pride and small-town spirit of Grant County’s 7,100 people will be evident in the special greetings, events and surprises we have in store for conference attendees. If you have questions or ideas; email OMA Conference Chair, Ann Dowdy, or call 541-226-1270. Successful proposals will be interesting, thoughtful, and promise to engage attendees with ideas on how to find common ground with museum peers, community members, groups and others. OMA aspires to include sessions representing the diversity of museum work, including sessions on fundraising, marketing, events, collections management, administration, programs, facilities maintenance, education, exhibits, and volunteer and board management, across all disciplines/specialties, regions, and museum sizes. We are looking for energized presenters to discuss projects and programs from around the state. Program formats include individual presentations, panels, and case studies. All session ideas will be considered and all are encouraged to apply.